Definition at line 244 of file llpanelavatar.h. Definition at line 1057 of file llpanelavatar.cpp. Definition at line 1182 of file llpanelavatar.cpp. References LLMessageSystem::addUUID(), gAgent, LLTabContainerCommon::getCurrentPanel(), LLAgent::getID(), LLPanelPick::getPickCreatorID(), LLPanelPick::getPickID(), LLAgent::getSessionID(), LLUICtrlFactory::getTabContainerByName(), gMessageSystem, LLAgent::isGodlike(), LLMessageSystem::newMessage(), LLMessageSystem::nextBlock(), NULL, LLTabContainerCommon::removeTabPanel(), and LLAgent::sendReliableMessage(). Definition at line 1081 of file llpanelavatar.cpp. References LLPanel::childSetVisible(), LLTabContainerCommon::deleteAllTabs(), and LLUICtrlFactory::getTabContainerByName(). 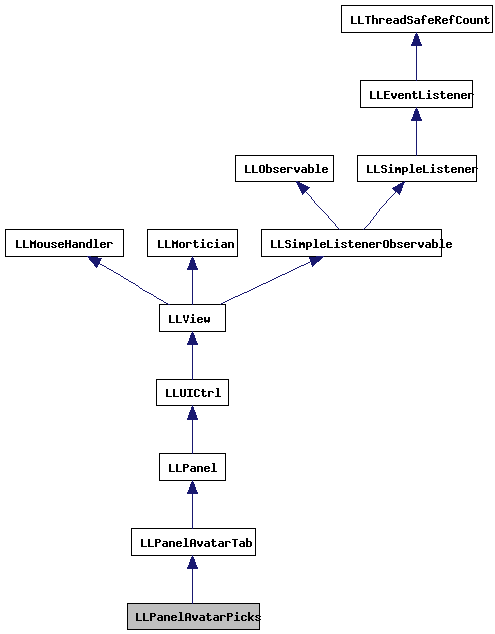 Referenced by processAvatarPicksReply(), and LLPanelAvatar::setAvatarID(). Definition at line 1164 of file llpanelavatar.cpp. References LLViewerWindow::alertXml(), callbackDelete(), LLTabContainerCommon::getCurrentPanel(), LLPanelPick::getPickName(), LLUICtrlFactory::getTabContainerByName(), gViewerWindow, and NULL. Definition at line 1148 of file llpanelavatar.cpp. References LLTabContainerCommon::addTabPanel(), FALSE, LLPanelPick::getPickName(), LLUICtrlFactory::getTabContainerByName(), LLPanelPick::initNewPick(), and LLTabContainerCommon::selectLastTab(). Definition at line 504 of file llpanelavatar.cpp. References LLPanel::childSetAction(), NULL, onClickDelete(), onClickNew(), and TRUE. Definition at line 1094 of file llpanelavatar.cpp. 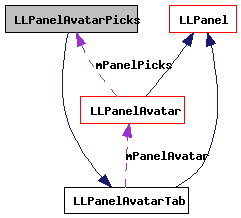 References LLTabContainerCommon::addTabPanel(), LLPanel::childSetVisible(), DB_PICK_NAME_SIZE, deletePickPanels(), FALSE, LLPanelAvatar::getAvatarID(), LLMessageSystem::getNumberOfBlocks(), LLPanelAvatarTab::getPanelAvatar(), LLMessageSystem::getString(), LLUICtrlFactory::getTabContainerByName(), LLMessageSystem::getUUID(), LLPanelPick::markForServerRequest(), NULL, S32, LLTabContainerCommon::selectFirstTab(), and LLPanelPick::setPickID(). Definition at line 1065 of file llpanelavatar.cpp. References LLPanel::childSetEnabled(), gAgent, LLPanelAvatar::getAvatarID(), LLAgent::getID(), LLPanelAvatarTab::getPanelAvatar(), LLUICtrlFactory::getTabContainerByName(), LLTabContainerCommon::getTabCount(), MAX_AVATAR_PICKS, S32, and LLPanelAvatarTab::sendAvatarProfileRequestIfNeeded().